A few weeks ago I described some of the algae that I found during a visit to the Avgás Gorge (pictured above) in Cyprus, including a chain-forming Ulnaria (see “Cypriot delights …”). I’ve now had a chance to prepare cleaned valves from this material so we can take a closer look. The chain-forming habit had already led David Williams to suggest Ulnaria ungeriana (Grunow) Compère 2001 and more detailed observations have confirmed this. This is a species that was actually first described from Cyprus (actually Northern Cyprus) and it was also recorded quite extensively during a survey of the island’s diatoms a few years ago. Unfortunately, some of the key diagnostic characters – such as small marginal spines and striae composed of single rows of pores – cannot be seen with light microscopy but the former, at least, can be inferred from the chain-forming habit. Note, too, how the long chains that dominated the population in the live state, fell apart when the sample was cleaned with oxidising agents and I did not see more than three cells joined together in the new preparation. Ulnaria ungeriana from Avgás Gorge, Cyprus, April 2018. Scale bar: 10 micrometres (= 1/100th of a millimetre). The Ulnaria ungeriana cells are mostly about 100 – 150 mm long and 7-8 mm wide, with a striae density of 9-10 / 10 mm. They have parallel sides, narrowing to rostrate to slightly sub-capitate ends, and central areas that reach to the valve margin and which are slightly longer than they are broad. Unfortunately, most of these characteristics overlap with those of Ulnaria ulna in all but most recent identification guides. 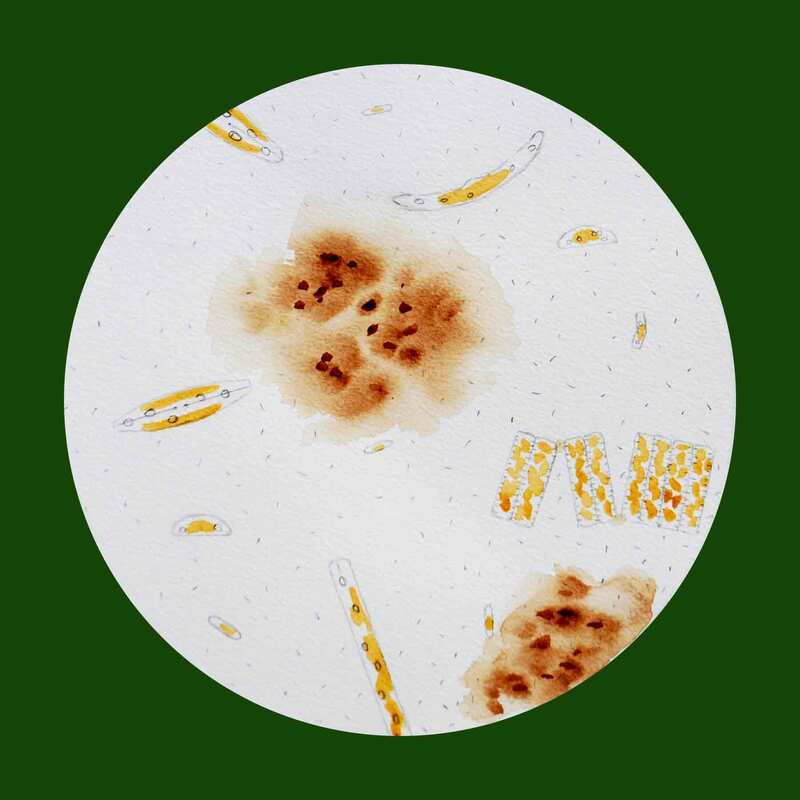 This species was first described by Nitzsch in 1817; it would have been one of the more conspicuous diatoms visible with the relatively basic equipment available at the time, with a magnification of about 150x. His drawings are of live cells, mostly in girdle view, which means that many of the details which modern diatomists use to discriminate species are not apparent. Moreover, the material on which these drawings are based is no longer available so we cannot go back to this in order to ascertain the characteristics of the original Ulnaria ulna and, to increase the confusion yet further, it is possible that Nitzsch has illustrated more than one species (see the reference by Lange-Bertalot and Ulrich below). It would be, in short, very easy to look at a population of Ulnaria ungeriana in the cleaned state and match it to the descriptions of Ulnaria ulna which, under various names, have appeared in the identification literature over the past 100 years or so. You might just detect the small marginal spines if you have a good microscope and know what you are looking for. In the live state, however, the ribbon-like colonies are a very distinctive feature yet these do not survive preparation, putting anyone who only encounters this species on a permanent slide at a distinct disadvantage. 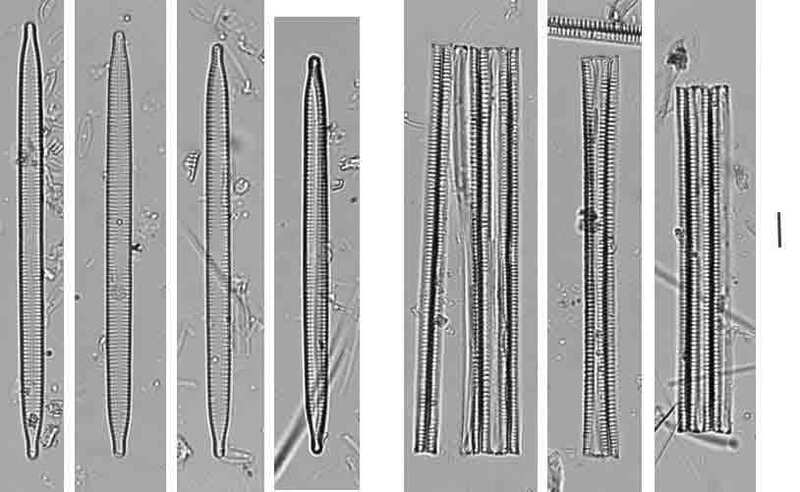 It is a good example of how examination of live material can add valuable information to an understanding of a diatom species yet, inevitably, many diatomists make little time for examination of their samples before dropping them into their bubbling cauldrons of oxidising agents. 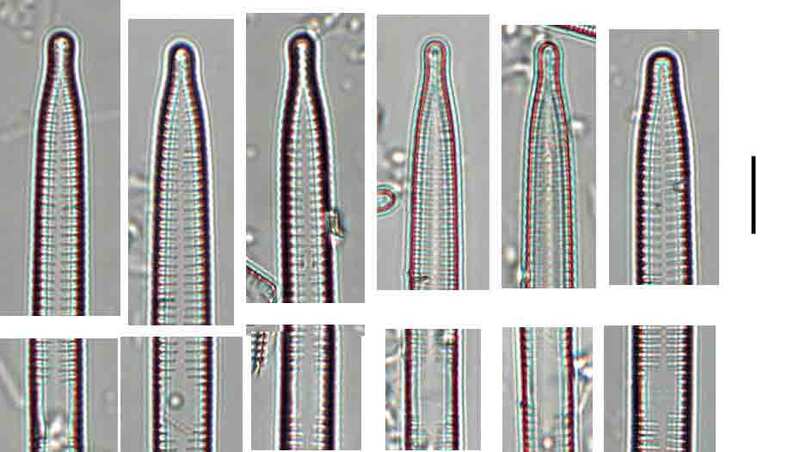 High magnification views of the ends and central portions of Ulnaria ungeriana valves. Scale bar: 10 micrometres (= 1/100th of a millimetre). What do we know about the ecology of Ulnaria ungeriana? Our survey of Cypriot streams a few years ago yielded 11 records, forming up to four percent of all diatoms in the sample. This means it is both less widespread and less dominant in samples than some other Ulnaria species. It was often found along with other Ulnaria species, in particular U. mondii and, though generally not associated with reference sites (one out of the 11 records), it was mostly found in relatively clean conditions. It was also associated with sites with high conductivity, which corresponds with the limestone geology that we saw in the Avgás Gorge. On the whole, these environmental preferences are similar to those of other Ulnaria species from Cyprus that we’ve studied (see reference in earlier post). The last question is perhaps the hardest to answer. What benefit does the chain-forming habit confer upon Ulnaria ungeriana? Ulnaria often forms tufts of upright cells sharing a common pad of mucilage at the base, and it is often (but not exclusively) found as an epiphyte on other plants. We can’t rule out the possibility that the Ulnaria ungeriana chains are not also attached at one end, but it is also possible that the chain-forming habit means that they are easily entangled with the Chara and filamentous green algae that I described in the earlier post. 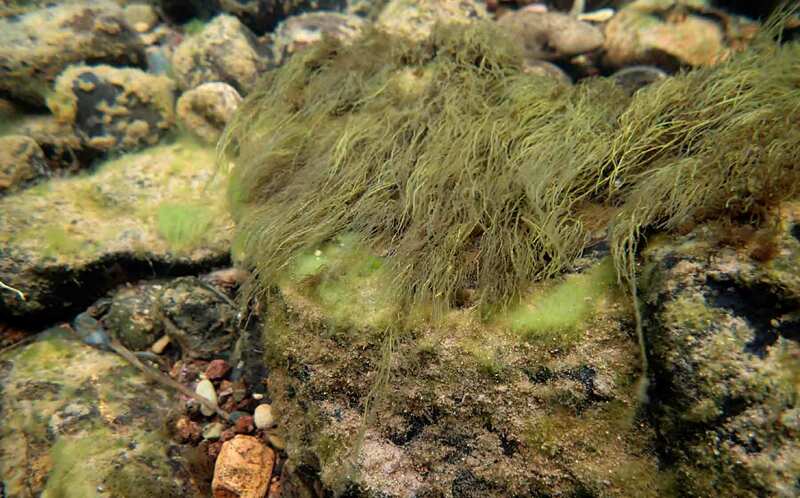 Both mucilage pads and entangled chains fulfil the same role of keeping the alga in the same spot in the stream, particularly where there are other plants and filamentous algae to offer extra protection from the current. 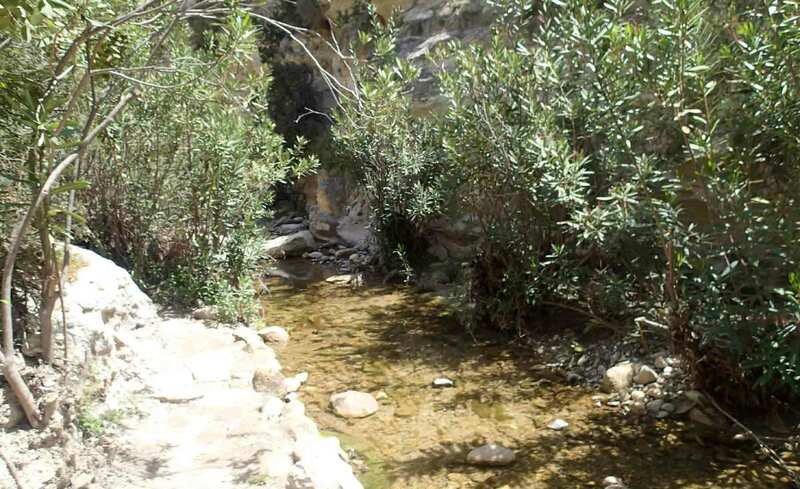 Ecological preferences of Ulnaria ungeriana at running water sites in Cyprus. a. pH; b. conductivity; c. total nitrogen (TN) and d. total phosphorus (TP). Arrows indicate the mean value for each variable, weighted by the relative abundance of Ulnaria ungeriana in the sample. Krammer, K. & Lange-Bertalot, H. (1991). Süsswasserflora von Mitteleuropa 2 Bacillariophyceae, 3 teil: Centrales, Fragilariaceae, Eunotiaceae. Spektrum Akademischer Verlag, Heidelberg, Berlin. Lange-Bertalot, H. & Ulrich, S. (2014). Contributions to the taxonomy of needle-shaped Fragilaria and Ulnaria species. Lauterbornia 78: 1-73. I took a few minutes out on my trip to Upper Teesdale to stop at Wolsingham and collect one of my regular samples from the River Wear. 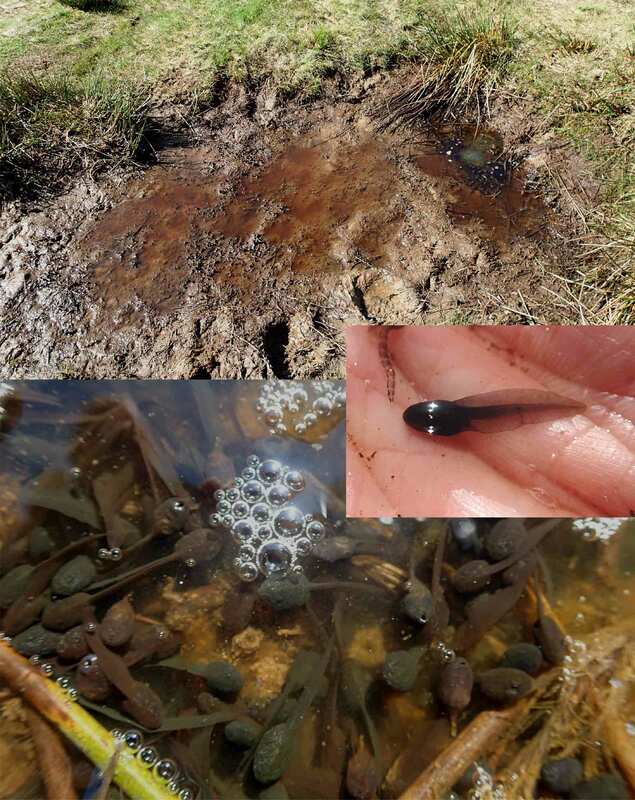 Back in March, I commented on the absence of Ulothrix zonata, which is a common feature of the upper reaches of rivers such as the Wear in early Spring (see “The mystery of the alga that wasn’t there …”). I put this down to the unusually wet and cold weather that we had been experiencing and this was, to some extent, confirmed by finding prolific growths of Ulothrix zonata in late April in Croasdale Beck (see “That’s funny …”). Everything seems to be happening a little later than usual this year. So I should not have been that surprised to find lush growths of green algae growing on the bed of the river when I waded out to find some stones from which to sample. These growths, however, turned out to be Stigeoclonium tenue, not Ulothrix zonata (see “A day out in Weardale”): it is often hard to be absolutely sure about the identity of an alga in the field and, in this case, both can form conspicuous bright green growths that are slimy to the touch. Did I miss the Ulothrix zonata bloom in the River Wear this year? Maybe. Looking back at my records from May 2009 I see that I recorded quite a lot of narrow Phormidium filaments then but none were apparent in this sample. That taxon thrived throughout the summer, so perhaps, again, its absence is also a consequence of the unusual weather. Growths of Stigeoclonium tenue on a cobble in the River Wear at Wolsingham, May 2018. 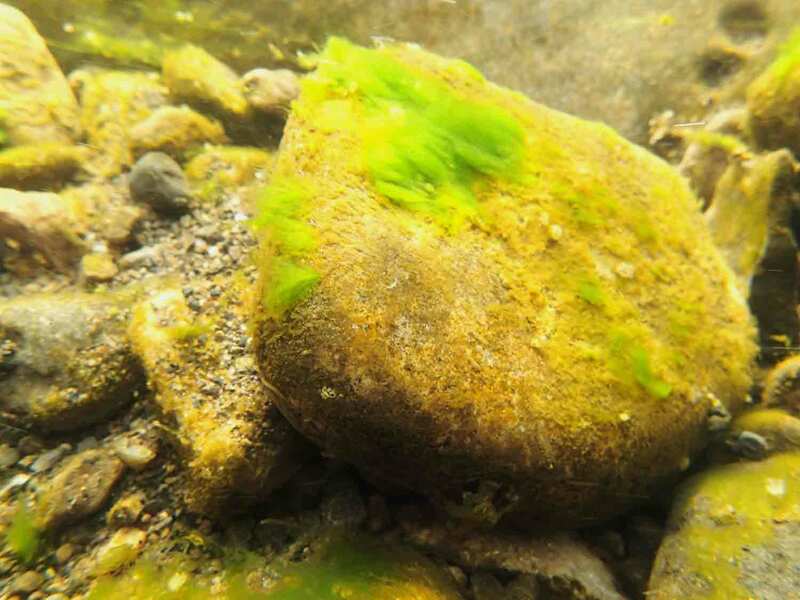 The photograph illustrates some of the problems that ecologists face: the distribution of algae such as Ulothrix zonata and Stigeoclonium zonata is often very patchy: there is rarely a homogeneous cover and, often, these growths are most prolific on the larger, more stable stones. I talked about this in Our Patchwork Heritage; the difference now is that the patchiness is exhibited by different groups of algae, rather than variation within a single group. Ironically, the patchiness is easier to record with the naked eye than by our usual method of sampling attached algae using toothbrushes. That’s partly because we tend to sample from smaller substrata (the ones that we can pick up and move!) but also because of the complications involved in getting a representative sample. 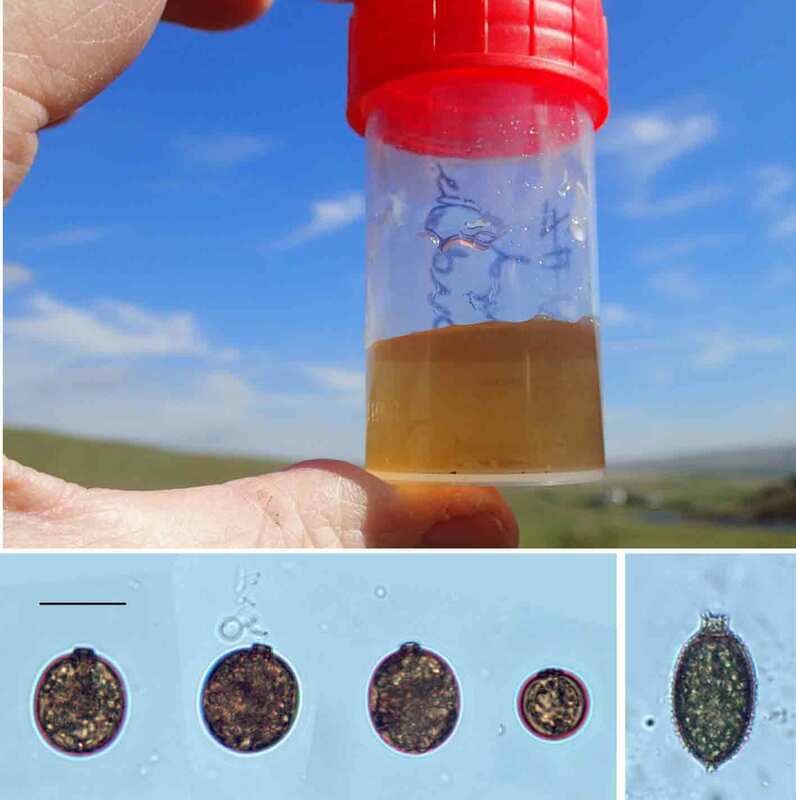 We have experimented with stratified sampling approaches – including some stones with green algae, for example, in proportion to their representation on the stream bed – but that still means that we have to make an initial survey to estimate the proportions of different types of growth. Under the microscope, therefore, the algal community looks very different. There are fewer green cells and more yellow-brown diatom cells, these dominated by Achnanthidium minutissimum, elegant curved cells of Hannaea arcus and some Navicula lanceolata, still hanging on from its winter peak. The patterns I described in The mystery of the alga that wasn’t there … are still apparent although the timings are all slightly adrift. 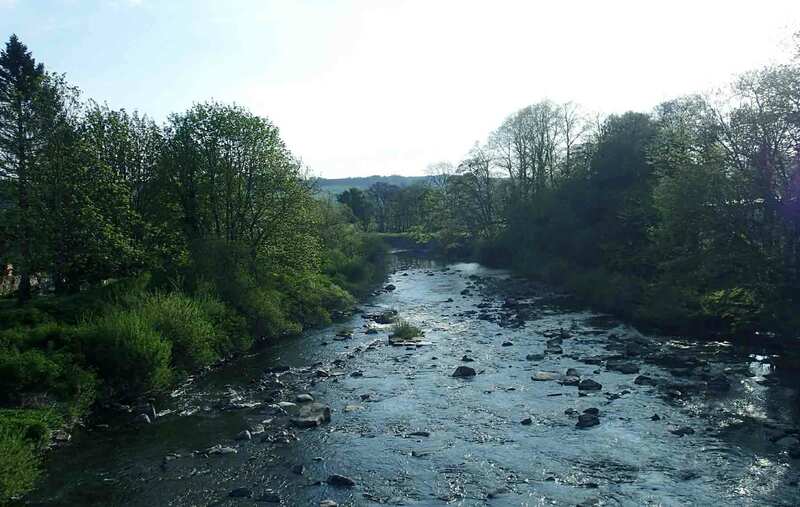 A view of the biofilm from the River Wear, Wolsingham in May 2018. The schematic view below tries to capture this spatial heterogeneity. On the left hand side I have depicted the edge of one of the patches of Stigeoclonium. Healthy populations of Stigeoclonium do no support large populations of epiphytes, probably as a result of the mucilage that this alga produces. My diagram also speculates that the populations of Gomphonema olivaceum-type cells and Ulnaria ulna may be living in the shadow of these larger algal growths, as neither is well adapted to the fast current speeds on more exposed rock surfaces. Finally, on the right of the image, there are cells of Achnanthidium minutissimum, small fast-growing cells that can cope with both fast currents and grazing. I have not included all of the taxa I could see under the microscope, partly because of the space available. There is no Hannaea arcus or Navicula lanceolata and I have also left out the chain of Diatoma cells that you can see on the right hand side of the view down the microscope. The speckled background in the image of the view down the microscope is, by the way, a mass of tiny bacteria, all jigging around due to Brownian motion. The sample had sat around in the warm boot of the car for a few hours after collection so I cannot be sure that these were quite as abundant at the time of collection as they were when I came to examine it. However, some people have commented on the absence of bacteria – known to be very abundant in stream biofilms – from my pictures, so these serve as a salutary reminder of an extra dimension that really needs to be incorporated into my next images. 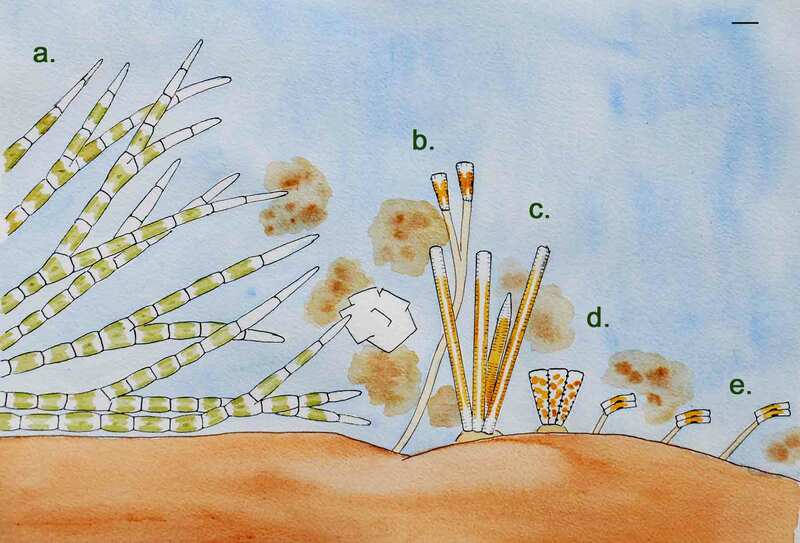 Schematic view of the biofilm from the River Wear at Wolsingham, May 2018. a. Stigeoclonium tenue; b. Gomphonema olivaceum complex; c. Ulnaria ulna; d. Meridion circulare; e. Achnanthidium minutissimum. Scale bar: 10 micrometres (= 1/100th of a millimetre). A paper has just been published that should be required reading for anyone interested in the management of nutrients in in ecology. It is a follow-up of a 2006 paper with the catchy title “How green is my river” that set out to provide a conceptual framework for how rivers responded to enrichment by nutrients. That original paper contained several good ideas but, crucially, not all of them were underpinned by evidence. A decade on, several of the predictions and statements made in that original paper have been tested, and the time has come to re-examine and modify that original conceptual model. 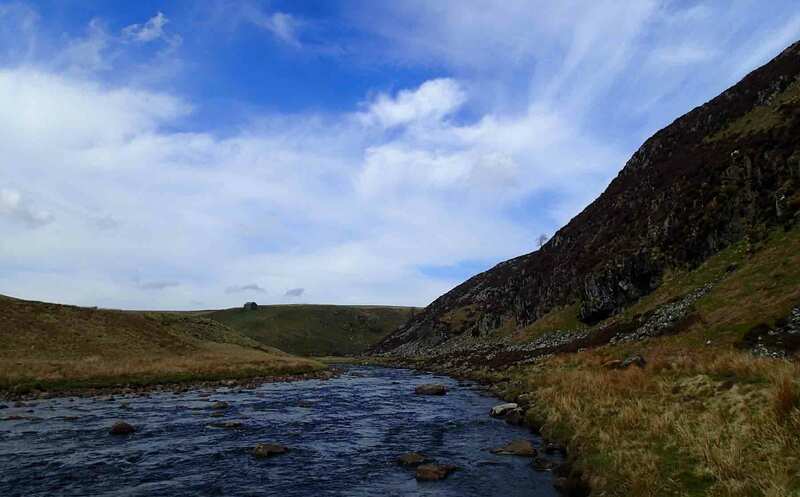 My reaction to the 2006 paper was that it was very interesting but not fully reflective of the rivers in my part of Britain, whose rougher topography produced quite different responses to nutrient enrichment than that proposed in their original model. 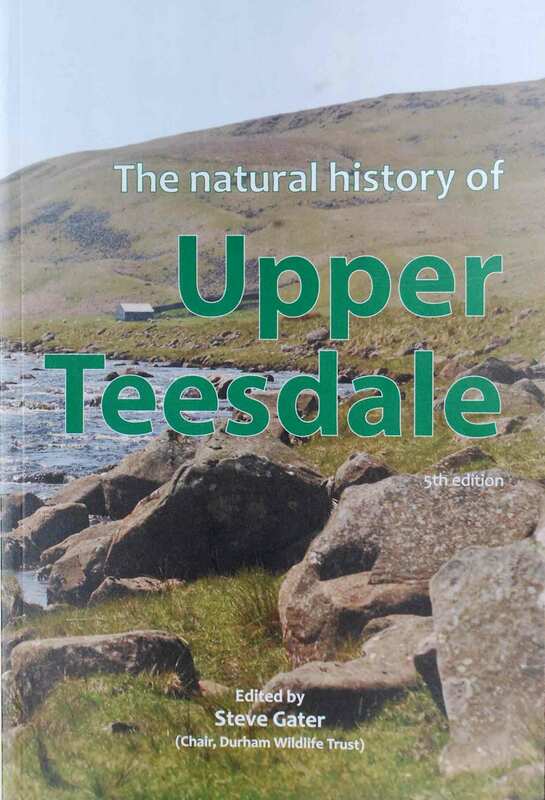 That criticism has been addressed in the revised version, which places greater emphasis on the physical habitat template, which means that it is more broadly applicable than the original version. But that, in turn, got me wondering about the continued relevance of a term such as “eutrophication” to rivers. People have been using the term “eutrophic” to describe lakes with high concentrations of nutrients since early in the 20th century. 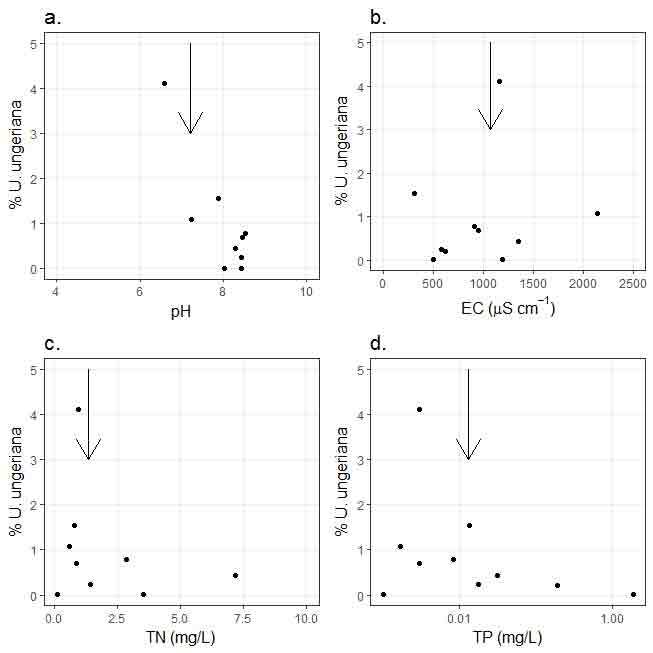 As the century progressed, evidence of a causal relationship between inorganic nutrients and algal biomass, and the consequences for other components of lake ecosystems grew. With this foundation, it has then become possible to predict the benefits of reducing nutrients and there are plenty of case studies, particularly from deep lakes, that demonstrate real improvements as nutrient concentrations have declined. Attempts to apply the same rationale to rivers have, however, met with far less success. Legislation to reduce nutrients in rivers has been in force in Europe since 1991 (the Urban Wastewater Treatment Directive, followed by the Water Framework Directive) and whilst this has led to reductions in concentrations of phosphorus in rivers (see “The state of things, part 2”), there has, in most cases, not been a corresponding improvement in ecology. There are a number of reasons for this but, at the heart, there was a failure to understand that the tight coupling between nutrients and biology that was the case in deep lakes did not also occur in running waters. What was needed was recognition of fundamental differences between lakes and rivers, and “How green is my river?” and, now, this new paper have both contributed to this. However, one consequence of recognising the importance of the physical habitat template alongside nutrients is to challenge the relevance of the term “eutrophic” when describing rivers. “Eutrophic” literally means “well-nourished” so is appropriate in situations where high nutrients cause high plant or algal biomass. This high biomass (strictly speaking, the primary production arising from this biomass) then creates problems for the rest of the ecosystem (night-time anoxia caused by plants consuming oxygen being a good example). If high biomass can arise due to, let’s say, removal of bankside shade or alteration to the flow regime, perhaps (but not always) in combination with nutrients, then perhaps we need a term that does not imply a naïve cause-effect relationship with a single pressure? My suggestion is to shift the focus from nutrients to plant growth by using the term “euphytic” (“too many plants”) as this would shift the emphasis from simply driving down nutrient concentrations (expensive and not always successful) towards reducing secondary effects. It is possible that strategies such as planting more bankside trees, for example, or altering the flow regime or channel morphology (see “An embarrassment of riches …”) may be just as beneficial, in some cases, as reducing nutrient concentrations. That said, we also have to bear in mind that nutrients may have an effect well downstream, so focus on amelioration of effects within a particular stream segment will never be a complete solution. I should emphasise that a lot of work has been done in recent years to understand the concentrations of nutrients that should be expected in undisturbed conditions, and also to understand the nutrient concentrations that lead to changes in community structure in both macrophytes and algae. These show that many rivers around Europe do have elevated concentrations of nutrients and I am not trying to side-step these issues. I do, however, think it is important that regulators can prioritise those rivers in greatest need of remediation and, in most cases, they do this without considering the risk of secondary effects. It is, largely, a matter of semantics. I have been involved in many conversations over the past couple of decades about how to improve the state of our rivers. Many of those have centred on the importance of reducing nutrient concentrations (which would be, indisputably, a major step towards healthier rivers). But there is more to it than that. And Mattie O’Hare and colleagues are helping to open up some new vistas in this paper. 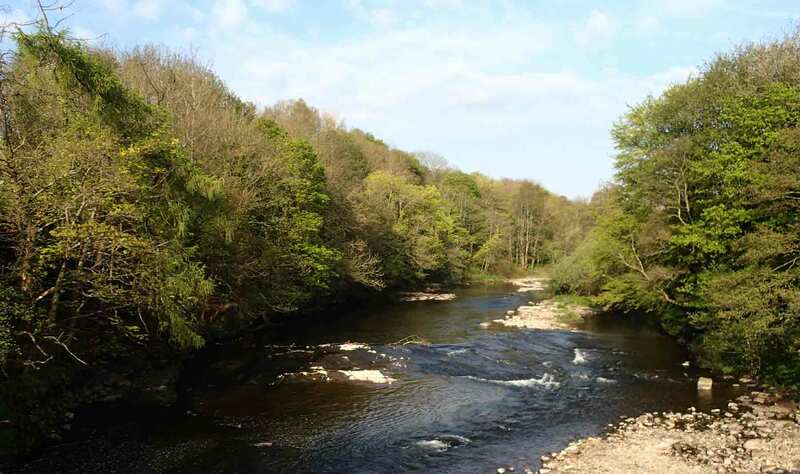 Note: the photograph at the top of this post shows the River Wear at Wolsingham. This stretch of the river captures many of the challenges facing river ecologists: nutrient concentrations are relatively low and there is good bankside shade. However, the flow of the river is highly altered due to impoundments upstream and a major water transfer scheme. How do all these factors interact to create the often prolific algal growths that can be seen here, particularly in winter and spring? Hilton, J., O’Hare, M., Bowes, M.J. & Jones, J.I. (2006). How green is my river? A new paradigm of eutrophication in rivers. Science of the Total Environment 365: 66-83. I comment on the role that grazers play in controlling algal biomass in rivers in these posts and this is the time of year when I, myself, take a more participatory role. As it is spring, Lemanea fluviatilis is thriving in our rivers (the cleaner ones, at least) and I could not resist grabbing a couple of handfuls whilst out in the field recently for culinary purposes. This time, I followed the routine I described in “More from the Lemanea cookbook … ” and washed, air-dried and then cut-up some Lemanea filaments into short lengths (they need to be about a centimetre long, otherwise they can form clumps). My experience is that the fishy taste of Lemanea is a fine complement to freshwater fish, so decided to use it in a warm potato salad which I then served underneath a salmon fillet seasoned and sprinkled with dill and then wrapped in foil and baked with a couple of knobs of butter. The warm potato salad needs a mayonnaise made from one egg yolk and about 150 ml of olive oil into which a couple of tablespoons of lemon juice are stirred, along with salt and pepper. Add a generous handful of dried Lemanea to this and leave to soften for about 20 minutes, and also add a teaspoon of capers and a small handful of land (or water) cress. Cook and drain enough new potatoes for two, then cut these into small chunks and stir the mayonnaise and algae mixture into these. Divide between two warmed bowls and place half the salmon fillet on top of each. Finally, add a few fresh pea shoots as a garnish, along with a wedge of lemon, and serve. 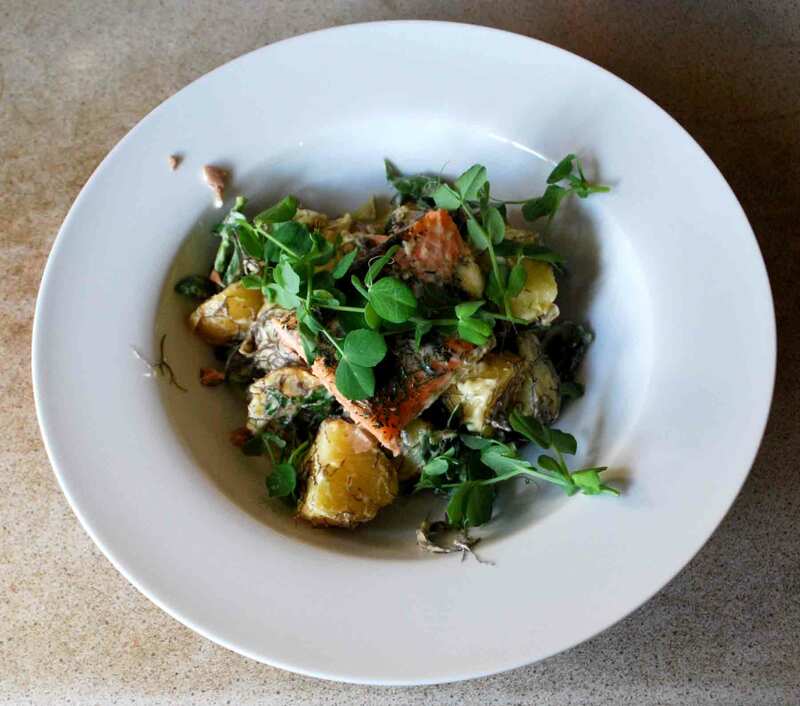 Warm potato salad with lemon and Lemanea, served with salmon fillets.